Mool Mantar Katha Vichar By Gyani Sant Singh Ji Maskeen – Download Gurbani Katha of Gyani Sant Singh Ji Maskeen. 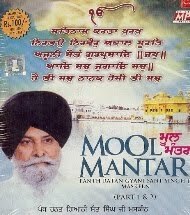 Download free Mool Mantar Katha Vichar album of Gyani Sant Singh Ji Maskeen. Panth Rattan Gyani Sant Singh Ji Maskeen was a very respectable soul in all the Guru Nanak Nam Leva Sangat.Here i am sharing a one of the nice Katha album by bhai sahib based on katha vichar of Sikh Mool Mantar.This katha is available in two parts.